Before the leaves start changing colors and a chill begins to form in the Midwest air, make some new memories in Crawfordsville! Browse our list of fun outdoor activities to top off your summer before the season’s end. Ready for an adrenaline boost? Experience the thrill of flying through the treetops surrounded by nature at Indiana Zipline Tours, Inc. This eco-friendly zipline company has built their canopy tour with nature in mind. Choose between 8 ziplines with no towers to climb, no parking lot views, and no highway noise. Pick from canoeing or kayaking trips lasting three hours, seven hours, or even overnight at Sugar Creek Campground and Canoe Rentals. Look for bald eagles and, on longer trips, stop to eat lunch and hunt for fossils while taking in the beautiful sites of Sugar Creek. Looking to spend more time in nature? Spend the night at the Sugar Creek Campgrounds! Take your Trail Rated® Jeep Wrangler or ATV and hit up the Bad Lands Off Road Park. A private park featuring over 800 acres of family-friendly fun located about 40 minutes outside of Crawfordsville offers an exciting alternative to the standard outdoor fair. Whether you drive your own trail ready SUV, or rent an ATV there, you are in for day to remember. If you are looking for a different sort of vehicular adventure this summer, check out Ben Hur Speedway. Home of the Indiana State Dirt Championships, this ⅓ mile track offers plenty of entertainment for racers and spectators alike. Racing season runs until the end of October and resumes in April. Spend a morning playing a round of golf with friends at Crawfordsville Golf Course. They offer fun events like couples nights, as well as discounts and specials. Visit on Terrific Tuesday or sign up for Last Minute Deals to get a discounted game. 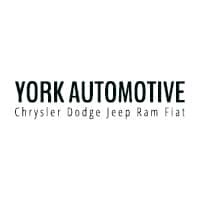 Whether you are looking for more off-roading adventures near Crawfordsville or other local recommendations, we are ready to be of assistance at York Chrysler Dodge Jeep Ram FIAT. Reach out and our local team will you give you the inside info of the Crawfordsville must-dos.